The Hosa Headphone Extension Cable adds extra length of cabling to your headphones. Whether you are in the studio or at home relaxing, the Hosa headphone extension cable gives you room to move without unplugging. Plus it removes the strain on your cable that is attached to the headphones. 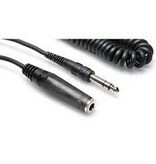 Stereo 1/4-inch male to stereo 1/4-inch female connectors with coiled or straight cable design.